A few days ago the Daily Mail carried a quite shocking story about the Prime Minister’s cold-hearted callousness. 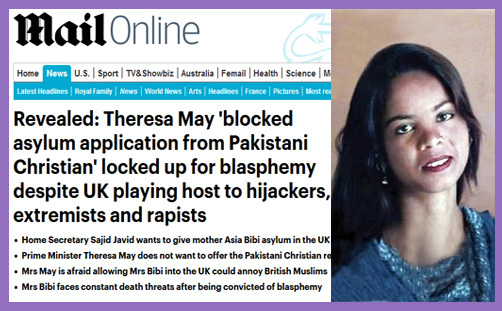 The report claimed that Theresa May had personally intervened and ‘blocked’ an asylum application from Asia Bibi, effectively abandoning her to the Islamist hordes in Pakistan where she is currently being hunted door-to-door so she can be hanged from the nearest tree for crimes against Mohammed. The Mail‘s story was so shocking that it reverberated around the world, though not (significantly) via many other UK mainstream media outlets. A few prominent blogs churned it, spreading the true horror of the PM’s ruthlessness and inhumanity, while the saintly Home Secretary Sajid Javid and Foreign Secretary Jeremy Hunt were feted for their virtue. They want Asia Bibi to be granted asylum, but were over-ruled by Mrs May. Honestly what kind of Christian; what kind of vicar’s daughter could possibly contemplate leaving a persecuted and hunted sister to certain death? The ostensible reason for refusing Asia Bibi asylum is that to do so might risk inflaming community tensions in the UK: there is no point fleeing Islamist hordes in the frying pan only to encounter Islamist hordes in the fire. So the Queen’s multicultural peace must be maintained, and if that means Asia Bibi must be kept out, so be it. First—I might say this in answer to a number of questions—my hon. Friend should not necessarily believe everything he reads in the papers. The position that the Government take is very clear: our prime concern must be the safety and security of Asia Bibi and her family, and we want to see a swift resolution of the situation. Obviously, there is a primary function for the courts and Government in Pakistan. The Prime Minister, Imran Khan, has publicly supported the Supreme Court and has promised to uphold the rule of law, while providing continued protection for Asia Bibi. We could approach this in two ways. We could go out there and say something, just to show that the UK is doing that, or we could ask what is right for Asia Bibi. We are working with others in the international community and with the Pakistani Government to ensure that our prime aim—the safety and security of Asia Bibi and her family—is provided for. Some have scoffed at this response; indeed, they have used it as a stick with which to beat the Prime Minister further as they hunt her from door-to-door in the hope of hanging her for crimes against Brexit. But her critics need to take a step back and reflect. Theresa May’s stated concern, her prime aim is “the safety and security of Asia Bibi and her family”. The Government’s policy, which the Daily Mail (inter alia) doesn’t appear to understand, is not to virtue-signal to the whole world and rub Pakistan’s nose in its barbarism; it is to help Asia Bibi get out of Pakistan to somewhere safe she wants to go. The Prime Minister has stated that HM Government is working with others, ergo we may surmise that Asia Bibi and her family have another country in mind and that considerable efforts are being made behind the scenes to enable this to happen. It isn’t that the UK has refused Asia Bibi asylum, or that the Prime Minister has ‘blocked’ it: it is simply that Asia Bibi has made no such application because she appears to have another country in mind, and those negotiations are advanced and ongoing. The UK is working to aid this rather than cut across it. And there is a further dimension of tension in this case to which the Mail (inter alia) is apparently oblivious. Like many countries where Britain used to be a colonial power, there are those who resent, loathe and despise all things British. Within some such cultures, there are well-developed erroneous conspiracy theories propagated by all manner of schismatic sects that the UK is somehow to blame for every evil which befalls them. In Pakistan, there are those who see the kafir hand of the Christian Queen (and her ministers) to be orchestrating Asia Bibi’s escape, and so the Prime Minister has to be somewhat circumspect about what she says publicly, as her response to Zac Goldsmith suggests. Indeed, if you watch the exchange, you see the Prime Minister is choosing her words very carefully indeed – not, as some suggest, because she is giving the answer which was “drafted by Sir Humphrey Pontius-Pilate”, but because to speak candidly and openly might inflame the situation in Pakistan and imperil the safety and security of Asia Bibi and her family. This case has already led to deaths of Minorities Minister Shahbaz Bhatti and Punjab Governor Salmaan Taseer. It isn’t for fear of inflaming Islamist tensions in Bradford that the Prime Minister is being cautious, but the very real terror of what might be unleashed upon hundreds of Christians and churches in Pakistan if the the old colonial power were seen to be intervening in an internal matter of justice which Allah has preordained. A direct intervention might potentially inflame once again sectarian tensions which have already led to riots and deaths. People seem to have forgotten that when Pope Benedict XVI spoke about the sword of Mohammed during his Regensburg lecture, Muslims rioted, churches were bombed, crosses were destroyed, effigies of Pope Benedict were burned, and a nun was killed. Might it simply be that Theresa May is mindful of this, and has no desire at all to fan the flames? And might this not also be the reason for the Archbishop of Canterbury’s Twitter silence? He, too, has been subject to a steady stream of opprobrium for not publicly supporting the campaign to grant Asia Bibi asylum in the UK (like if he doesn’t tweet about something it means he’s doing absolutely nothing about it). Might it be that his position and that of the Prime Minister are not as unvirtuous as they appear; that they both simply want to do the right thing rather than just be seen to be doing the right thing and then tweeting how wonderful and Christian they are? If Asia Bibi made it know publicly that she would like to be granted asylum in the UK (which patently appears not to be the case), do you really believe Theresa May would say, ‘No, we don’t want you here’? Really?